Shows the balance of classes and their associated predictions. 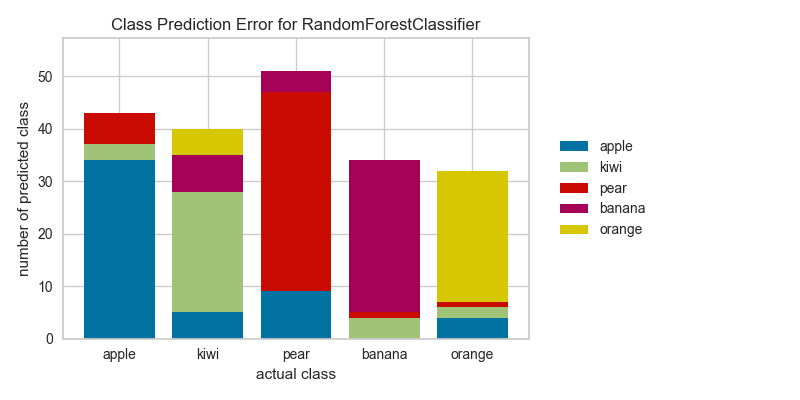 Class Prediction Error chart that shows the support for each class in the fitted classification model displayed as a stacked bar. Each bar is segmented to show the distribution of predicted classes for each class. It is initialized with a fitted model and generates a class prediction error chart on draw. the axis to plot the figure on. Scikit-Learn estimator object. Should be an instance of a classifier, else __init__() will raise an exception. Renders the class prediction error across the axis.